Wilf Hedley :45 Kanooka Street, Rivett, A.C.T. 2611. 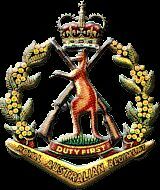 John Weatherley:treasurer8rarassn@hotmail.com. Postal: Via PO Box 4989, Forest Lake. QLD 4078. Association Address: PO Box 4989, Forest Lake, QLD 4078.